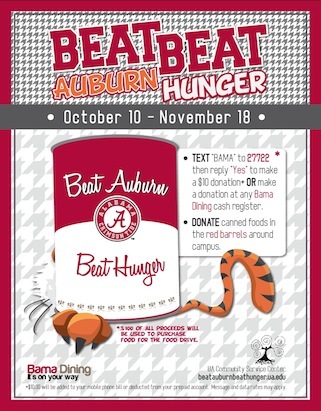 Join in the chapter's efforts to support the West Alabama Food Bank...and beat Auburn! UPDATE: UANYC donated $750 to the 18th Annual Beat Auburn Beat Hunger Food Fight. The chapter extends special recognition to Richard Adams, Laurie Ezell, Dona Romano and Brandi Whitlock for their online donations to lead the chapter's efforts in support of the BABH initiative. NEW YORK -- The Greater New York Chapter has pledged its support behind the 18th Annual Beat Auburn Beat Hunger (BABH) Food Fight, coordinated by the University of Alabama Community Service Center. The Beat Auburn Beat Hunger food drive is a competition between the University of Alabama and Auburn University to determine which school can raise the most non-perishable food items for their respective food banks to address hunger and poverty in the state of Alabama. Over the years, the West Alabama Food Bank and the Food Bank of East Alabama have received nearly three million pounds of food for needy Alabamians as a result of the competition. In 2010, BABH collected 218,510 pounds of food for the West Alabama Food Bank. Although donations increased by 20 percent over the previous year, Alabama's total did not overcome Auburn's 234,116 pounds. This year, the University is committed to bringing the title back to Tuscaloosa with a goal of 250,000 pounds of food. 1. Donate online on UANYC.com. Chapter officers and game watch captains will be collecting donations at upcoming football game watch parties as well so the chapter can coordinate one sizable donation to the cause on behalf of its members. 2. Corey Gibbs and Ticket Solutions, the official provider of entertainment tickets and Platinum Sponsor of the Greater New York Chapter, has graciously offered to set up a collection bin at his office in Tuscaloosa for non-perishable items. Feel free to stop by his office at 1410 University Blvd. (Suite 2) and drop off items when you are down for a game. 1. Text the word BAMA to 27722 and reply Yes to donate $10 (20 pounds of food). It will be added to your next cell phone bill. 2. Donate online on the University of Alabama website. All donations go to the West Alabama Food Bank. Through 65 member agencies, the West Alabama Food Bank serves nine counties in West Alabama. Counties served include Marion, Lamar, Fayette, Pickens, Tuscaloosa, Bibb, Sumter, Greene, and Hale. These counties have a population of over 316,000 residents; over twenty percent of whom are living in poverty. For more information, visit beatauburnbeathunger.ua.edu or contact Charlotte Brown, BABH Director, at 205-348-2865 or beatauburnbeathunger@gmail.com.